CHINA TOWN HALL is a national day of programming on China involving about 70 cities throughout the United States. The College of Education and Social Services, in partnership with the National Committee on U.S.-China Relations and The Carter Center, is pleased to announce the eighth annual CHINA Town Hall. 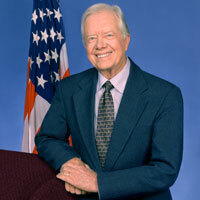 The national webcast features President Jimmy Carter, who will discuss the establishment of diplomatic relations between the United States and China 35 years ago, when he was president, as well as current issues in Sino-American relations. National Committee president Steve Orlins will moderate this 45-minute portion of the program, comprised of a 15-minute talk followed by half an hour during which President Carter will respond to questions submitted by audience members throughout the country. The live webcast, entitled “Issues in U.S.-China Relations”, will take place at 7:00 PM at the Fleming Museum Room 101. Prior to the presentation, China specialist Dr. Jeanne Shea of the Anthropology Department at the University of Vermont will give a lecture on "U.S.-China Linkages in Global Health". This presentation, which will begin at 6:00 PM, examines how the US and China are intimately linked in many ways in terms of global health. From the yearly flu, to global food safety, to infectious disease control efforts, to the consequences of sedentary modern lifestyles, to long-term care for chronic conditions, the health of our nations is increasingly a matter of bilateral exchange and collaboration. CHINA Town Hall is a national day of programming on China involving about 70 cities throughout the United States. This event is free and open to the public. Light refreshments will be provided at 6:00 PM. For more information or to request accommodations, please contact Jacqueline Drouin, Program Specialist for the Asian Studies Outreach Program, at Jdrouin@uvm.edu or by calling (802) 656-7985.